Learn to program the Propeller in Spin and C and how to map the Propeller Assembler (PASM) language from other high-level languages you might know. The overall task you will pursue in the book is to implement a Delta Compression algorithm: first in Spin, then in PASM, then in C. Along the way, you'll review test driven development, a powerful technique for validating code, and conclude with a chapter on hardware manipulations. 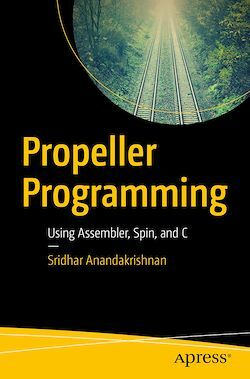 The book's main goal is to help you extend the capabilities of the Propeller processor by using the assembler language.